Ever since the Minnesota Orchestra lockout began, I’ve read a lot of articles on arts administration. (And from a unique perspective, too: not as a board member or an employee or a union shill, but as a concerned audience member.) Once in a while I’ll disagree with a particular point, debate it with friends, and then tuck the insights away. But. Last month I read an article that made me say “wait a minute…” so many times, I knew it could be used as bloggy fodder and discussion. It’s called Baumol’s Cost Disease Is Killing Me, and it was written by management consultant Duncan M. Webb. I feel very strongly that post-Minnesota, people who are still talking about Baumol’s Cost Disease in the way that Webb does are doing themselves and the institutions they advise a disservice. So I thought I’d take the chance to think out loud about some of the points he raises…from an audience member’s point of view. I first read Baumol and Bowen’s The Economic Dilemma of the Performing Arts some 20 years ago, almost 30 years after it was first published in 1965. The theory was fairly straightforward: the problem in our sector is that because there are no productivity gains associated with the creation of the work (it takes the same time and energy to rehearse and perform a Brahm’s Requiem today as it did when first performed in 1868), and because costs always increase over time and earned revenue growth is limited by a range of market forces, we are doomed to fall further and further behind, essentially forcing the more aggressive pursuit of contributed income just to balance the budget. And the problem is progressive, meaning that every year we fall a little bit further behind. This phenomenon has come to be known as Baumol’s Cost Disease. Let’s start at sentence number two. It takes the same time and energy to rehearse “a Brahm’s Requiem” now as it did in 1868? In 2010 my amateur string orchestra started doing an annual holiday gig at the local Community Table. Because the arrangements of holiday music were new to us, we spent pretty much the whole semester putting the program together. Fast forward four years. We’ve learned the pieces; they’re in our fingers; plus we all have four years’ additional study under our belts. Nowadays we prepare the Christmas music – plus a lot of other stuff – in the same amount of time. Behold, productivity gains! I don’t know how you’d go about quantifying it, but I’m sure something like this exists in the Real World, too. Every member of a professional orchestra has played Brahms before – in fact, has grown up playing Brahms. Those premiering the Requiem had no such advantage. Our modern familiarity with the Brahmsian language allows more time to work on other pieces, increase the quality of performance, or not have as many rehearsals. Behold, productivity gains! Not to mention, there is a general consensus that players today are better trained technically than their historical predecessors. This is why Vivaldi couldn’t have played pieces by Paganini. Behold, productivity gains! This all feels so obvious, I’m embarrassed to be writing it. After all these years, here is clear and incontrovertible proof of Baumol’s Cost Disease. Quick question: if this theory is so important, why did it take decades to find this clear and incontrovertible proof of its existence? 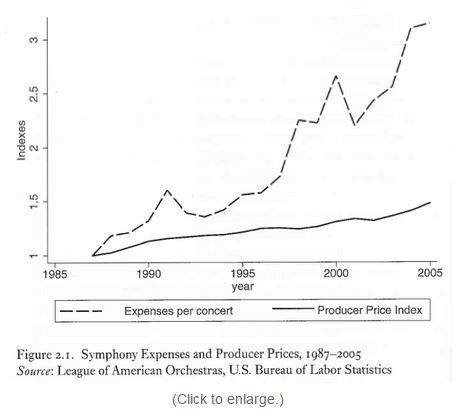 The dotted line shows the growth in expenses per concert, based on data collected from the 50 largest symphonies in the country as compared to the Producer Price Index — a reasonable proxy for the cost to produce other goods and services in the economy. What the graph shows is that while productivity gains (mostly around technology) have kept cost increases in the commercial sector low (only a 40% increase over 17 years), the costs to put on a concert have increased by 300% over that same period. Why is that? I’m thinking there are lots of potential caveats in that paragraph – lots of different stories to be told based on the lines in those graphs – and someone trained in economics would do better at pointing them out. 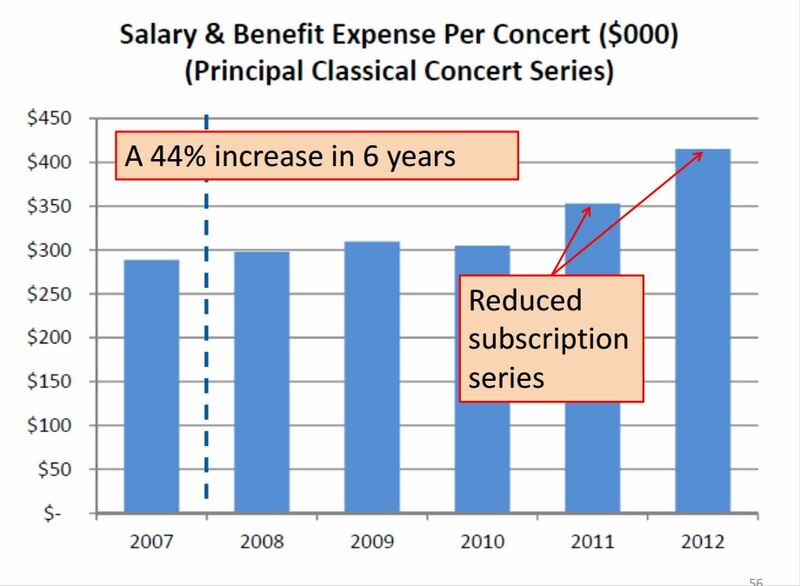 But the good folks at Save Our Symphony Minnesota (SOSMN) taught me that the cost of putting on concerts can fluctuate wildly depending on a variety of factors, including the number of concerts being given. For instance, according to their November 2013 Unlocking the Truth presentation, the Minnesota Orchestra’s cost-per-concert held relatively steady from 2007 to 2010, then skyrocketed from 2011 to 2012, partly because the musicians were paid slightly more, but also because the management chose not to schedule as many concerts in those years. And I imagine the cost-per-concert will decrease this season, between the concessions the musicians made and the increase in the number of concerts from the 2011 and 2012 seasons. Point being: there’s more to the equation than labor costs. I think that’s important to keep in mind. dumb people who are just too dumb to understand a simple concept? Frankly, they’re not really here. Okay, so around this paragraph I came down with a bad case of whatthef*ckitis. First, that people have been predicting the demise of this particular symphony orchestra for a hundred years. I’m guessing probably not; most orchestras aren’t a hundred years old, and if that’s what he’d meant, the author likely would have used the phrase it’s not really here, as opposed to they’re not really here. So second possibility: he’s speaking of the demise of symphony orchestras in general. But that doesn’t make any sense either, because Webb says symphony orchestras are “not really here,” when obviously many are. Yes, it’s anecdotal, but I look around and I see all sorts of ensembles, most of which were started thirty years ago, that continue to grow to this day. My amateur orchestra began in 2007. We’re always growing, and we now have more strings than the community orchestra in the town north of us, which was founded in 1983. There are two orchestras in Eau Claire that pay their members, one a symphony and one a chamber orchestra, begun in 1975 and 1998. There’s also the university symphony and university chamber orchestra, not to mention a youth orchestra for high school students (founded in 1980). Just two hours away we have the St. Paul Chamber Orchestra, which started in 1959, and of course all of these ensembles were totally undreamed of when the Minnesota Orchestra began in November 1903. If this proliferation is happening in the Eau Claire area, I’m guessing it’s happening in lots of other places, too…because I wouldn’t describe northwestern Wisconsin as a particular orchestral mecca. Which brings up another point: what symphony orchestras are we talking about, anyway? The big ones? The mid-tier ones? The community ones? The student ones? They’re all such different animals. To just lump them all together makes for so much confusion. Maybe analysts should stop doing that in discussions like these. And the research suggests harder times to come. Things are super hard for non-profits, and orchestras in particular? I never knew. So why aren’t more people waving this around and talking about it? Dude, where have you been? Everybody is talking about it. I admit I don’t keep a going list of times I encounter mentions of Baumol’s Cost Disease because I’ve got sh*t to do, but there are currently 19,600 Google results for it. That’s a lot of discussion. Do they believe they can be the exception to the rule? Or that they’re concerned about agitating relations with the already prickly union? Perhaps. I’m guessing that by prickly union, you mean “the prickly unionized musicians who serve on negotiating committees”? That Tim Zavadil, man. He’s so prickly. Which brings me to another point… Especially in the top echelon of American orchestras – “destination orchestras” – the players are going to be sticking around longer than the board chairs and CEOs. They probably have the strongest motivation of any party to ensure the long-term health of the organization, correct? After all, orchestra jobs aren’t just out there for the taking. In Minnesota leastways, these are intelligent, well-educated people, many of whom serve on the boards of non-profits, or even in some cases run their own. If they’re ever prickly, maybe it’s because somebody’s been poking them with needles trying to diagnose a case of Baumol’s Cost Disease. But I’m afraid that the real reason is that symphony managers are terrified of the prospect that donors might get a hold of this information and see that their donations are only prolonging the inevitable demise of the orchestra in its current form, as opposed to propelling it to future glory. Someday I’m going to die, but that doesn’t keep me from breathing now. And heck, isn’t this technically what every non-profit does: prolong their inevitable demise? The Minnesota Orchestral Association may have a huge endowment, but eventually the sun will burn out. I’m afraid it’s time for the sector to face the facts on this. This paternalistic attitude is the one that led Minnesota into its lockout. And as an audience member who had a front row seat to the Minnesota conflagration, I suggest orchestra lovers tread carefully when they see their organizations adopting it. In the gripping finale of Cost Disease Confusion, I’ll spew more random thoughts, look at the NEA’s Survey of Public Participation in the Arts, dig out some charts on the Met, and be completely and utterly baffled. Won’t you join me? Edit: Here’s a link! Excellent post! I’m also going to make a wild guess that ticket prices are higher now than in 1868, or 1965, for that matter. Keep up your good work! Sooo . . . if “earned income” is subject to “market forces”, then why the heck isn’t “producer price”? News flash – it IS!!! Productivity is supposedly up (b/c of “technology”), which supposedly pushes costs down, but isn’t a lot of that b/c of, say, job outsourcing and huge income disparity? The actual “producers” aren’t seeing increased rewards, but the overlords sure are. And yes, stopping at 2005 is indicative of something to hide (like, data that stubbornly refuses to support the hypothesis). As for cost increases – how about bloated and bloviating administrative costs, as well as, um, bonuses paid to those who manage to p*ss off both donors and “earned income” producers i.e. ticket buyers? Geez. Those who are f*cking clueless, consult. A good takedown of some gilded but fallacious arguments (with the usual brilliant wit). Whenever one sector of an economy is compared with another, there is ample room for many false analogies and misleading comparisons. If a new paradigm is needed, it’s at a general socio-economic level that has moved beyond mere industrialism with its emphasis on manufacturing widgets. I’m sorry if the value of the arts – among other things – does not lend itself to a model of thinking that is robbing us of much of our quality of life, but I really don’t want to live in a world of Wal-Mart values.